Septs of the clan include Davey, Dawson, Day, Dean, Dow, Kay, MacDade, and Slora, while the Inverness-shire Mackays are really said to be MacDhais. Although Davidson sounds a English name the clan is, in fact, a Gaelic tribe, one of the earliest to become associated with the confederation of the clan Chattan. The name comes from their leader, David Dubh of Invernahaven, who married a Mackintosh, daughter of the clan Chattan chief, in the mid-14th century. BADGE: Lus nan Braoileag (vaccineum vitis idea) Red whortleberry. ACCORDING to the Highland manuscript believed to be written by one MacLauchlan, bearing the date 1467, and containing an account of the genealogies of Highland clans down to about the year 1450, which was accepted as authoritative by Skene in his Celtic Scotland, and believed to embody the common tradition of its time, the origin of the Davidsons is attributed to a certain Gilliecattan Mhor, chief of Clan Chattan in the time of David I. This personage, it is stated, had two sons, Muirich Mhor and Dhai Dhu. From the former of these was descended Clan Mhuirich or Macpherson, and from the latter Clan Dhai or Davidson. Sir Aeneas Macpherson, the historian of the clan of that name, states that both the Macphersons and the Davidsons were descended from Muirich, parson of Kingussie in the twelfth century. Against this statement it has been urged that the Roman kirk had no parson at Kingussie at that time. But this fact need not militate against the existence of Muirich at that place. The Culdee church was still strong in the twelfth century, and, as its clergy were allowed to marry, there was nothing to hinder Muirich from being the father of two sons, the elder of whom might carry on his name, and originate Clan Macpherson, while the younger, David, became ancestor of the Davidsons. Still another account is given in the Kinrara MS. upon which Mr. A. M. Mackintosh, the historian of Clan Mackintosh, chiefly relies: This MS. names David Dubh as ancestor of the clan, but makes him of the fourteenth century, and declares him to be of the race of the Comyns. His mother, it says, was Slane, daughter of Angus, sixth chief of the Mackintoshes, and his residence was at Nuid in Badenoch. Upon the whole, it seems most reasonable to accept the earliest account, that contained in the MS. of 1467, which no doubt embodied the traditions considered most authentic in its time. The chiefs of the Davidsons are said to have been settled, in early times at Invernahavon, a small estate in Badenoch, at the junction of the Truim with the Spey, and when they emerge into history in 1370 or 1386 the holders of the name appear to have been of considerable number, and in close alliance with the Mackintoshes from whose forebears they claim descent. The event known as the battle of Invernahavon is well known as a landmark in Highland history. According to commonly accepted tradition, the older Clan Chattan, descended from Gilliecattan Mhor of the time of Malcolm Canmore or David I., saw the line of its chiefs come to an end in the latter days of the thirteenth century in the person of an only child, a daughter named Eva. This heiress in 1291 married Angus, the young sixth chief of the Mackintoshes, who along with her received from Gilpatrick, his father-in-law, not only the lands of Glenlui and Locharkaig, but also the chiefship of Clan Chattan. The lands of Glenlui and Locharkaig, however, appear to have been seized and settled by the Camerons, and eighty or ninety years later the dispute regarding their ownership came to a head. After many harryings of the Camerons by the Mackintoshes and of the Mackintoshes by the Camerons, it appears that in 1370 or 1386�accounts differ as to the date�a body of some four hundred Camerons made an incursion into Badenoch. As they returned laden with booty they were intercepted at Invernahavon by Lachlan Mackintosh, the eighth chief, with a body of Clan Chattan which included not only Mackintoshes but Macphersons and Davidsons, each led by its respective chieftain. At the moment of attack a dispute arose between the chiefs of these two septs as to which should have the honour of commanding Clan Chattan�s right wing. Macpherson claimed the honour as male representative of the chiefs of the, older Clan Chattan; Davidson, on the other hand, insisted that he should have the post as the oldest cadet. These claims would appear to uphold the account of the origin of these two septs which derives them, not from the Mackintoshes but from Gilliecattan Mhor, chief of the older Clan Chattan. Mackintosh, forced to decide in the urgency of the moment, gave the post of honour to the Davidson chief, and as a result, the Macphersons, highly offended, withdrew from the battle. As a result of this, the Mackintoshes and Davidsons, greatly outnumbered, were routed and cut to pieces. What followed is the subject of a tradition given by Bishop Mackintosh in his History of Moray. According to this tradition Mackintosh sent his bard to the Macpherson camp, where he treated the Macphersons round their camp fires to a taunting ballad describing the cowardice of men who forsook their friends in the hour of danger. This, it is said, so enraged the Macpherson chief that he forthwith called his men to arms, and fell upon the Camerons in their camp at midnight, where he cut them to pieces, and put them to flight. This battle at Invernahavon appears to have been one of the incidents which directly led up to the famous combat of "threttie against threttie" before King Robert III. on the North Inch of Perth in 1396. According to the chronicler Wyntoun, the parties who fought in that combat were the Clan Quhele and the Clan Kay, and authorities have always differed as to who these clans were. According to some, the battle was a direct outcome of the mutual jealousy of the Macphersons and Davidsons following the rupture at Invernahavon; and the Gaelic name of the Davidsons, Clan Dhai, which might easily be mistaken by a Lowland chronicler for Kay, lends some superficial colour to the claim. It is scarcely likely, however, that the Macphersons and Davidsons were at that time so important as to warrant a great national trial by combat such as that on the North Inch, which has made such a striking mark in Scottish history. The probability seems rather to be that the combat within the barriers before King Robert III. was between Clan Chattan as a whole and Clan Cameron. According to the Kinrara MS., Clan Quhewil was led on the North Inch by a Mackintosh chieftain, Shaw, founder of the Rothiemurcus branch of the family. MacIan, in his Costumes of the Clans of Scotland, is evidently seeking a pretext when he asserts that it was mortification at defeat on the North Inch which drove the Davidsons into obscurity, and finally induced the chief with some of his followers to remove further north, and settle in the county of Cromarty. It seems more likely that the decimation of their ranks at Invernahavon, and the losses caused by subsequent feuds, so reduced the numbers of the clan as to render it of small account during the succeeding century. Lachlan Shaw in his MS. history of Moray states that early in the seventeenth century the Invernahavon family changed its name from Davidson to Macpherson, the individual who did so being James of Invernahavon, commonly called Seumas Lagach, great-grandfather of John of Invernahavon. But Mr. A. M. Mackintosh, the historian of Clan Chattan, has ascertained that the James of Invernahavon referred to was son of a John Macpherson, who, according to Sir Aeneas Macpherson�s MS., had feued the property. It can thus be seen how Lachlan Shaw made the mistake of supposing that the Davidsons of Invernahavon had changed their name. The historian of Clan Chattan above referred to offers another theory to account for the comparative disappearance of Clan Davidson from the historic page, by pointing out that two of the name were concerned in the murder of Lachlan, the fourteenth Mackintosh chief, in 1524. One of these two, Milmoir MacDhaibhidh, was the chief�s foster-brother, but believed that Mackintosh had helped to destroy his prospects of marrying a rich widow, and accordingly, on 25th March, along with John Malcolmson and other accomplices, fell upon the chief and slew him while hunting at Ravoch on the Findhorn. For this deed the three assassins were seized and kept in chains in the dungeon on Loch.an-Eilan till 1531, when, after trial, Malcolmson was beheaded and quartered, and the two Davidsons were tortured, hanged, and had their heads fixed on poles at the spot where they committed the crime. Mr. Mackintosh also points out that another Davidson, Donald MacWilliam vic Dai dui, conspired with the son of the above John Malcolmson against William, the fifteenth Mackintosh chief in 1550 when the head of that chief was brought to the block by the Earl of Huntly at Strathbogie. The Davidsons who did these things, however, were merely servants and humble holders of the name, and their acts can hardly have brought the whole clan into serious disrepute. That the Davidsons did not altogether cease to play a part in important events is shown by an entry in the Exchequer Rolls (iv. 510) in 1429. This is a record of a distribution of cloth of divers colours to Walter Davidson and his men by command of the King, and the gift is taken to be possibly an acknowledgment of the loyalty of the Davidson chief and his clan during the Highland troubles of the year. Later popular tradition has associated the Davidsons with the estate of Davidston in Cromarty, the laird of which is mentioned in 1501 and 1508, in the course of a legal action taken against Dingwall and Tain by the Burgh of Inverness. Here again, however, the historian of Clan Chattan has pointed out that, according to Fraser Mackintosh�s Invernessiana, pages 175-184, the owners of the estate of Davidston were a family named Denoon or Dunound. In any case, however, the Davidsons had taken root in this neighbourhood. In the second half of the seventeenth century Donald Davidson owned certain land and other property in Cromarty. His son, Alexander Davidson, was town clerk of the county town, and his son William succeeded him in the same office. In 1719 this William Davidson married Jean, daughter of Kenneth Bayne of Knockbayne, nephew and heir of Duncan Bayne of Tulloch. The son of this pair, Henry Davidson, born in 1729, made a great fortune as a London West India merchant. His wife was the daughter of a shipmaster of Cromarty, who was son of Bernard MacKenzie, last Bishop of Ross. In 1763, when the estate of Tulloch was sold by the creditors of the ancient owners, the Baynes, it was purchased by Henry Davidson for �10,500, and has since been the seat of his family. On the death of Henry Davidson, first of Tulloch, in 1781, he was succeeded by his brother Duncan. This laird was an energetic and notable man in his day. On the Tulloch estate he carried out vast improvements, including the reclamation of a great stretch of land from the sea, and the construction of the main road from Dingwall to the North. He was provost of Dingwall from 1784 till 1786, and M.P. for Cromarty from 1790 to 1796. This laird�s son, Henry, was, like his uncle, a successful West India merchant in London, and, like his father, was a great planter of woods and reclaimer of land. His son, Duncan, the fourth laird of Tulloch, began life as an officer in the Grenadier Guards. His first wife was a daughter of the third Lord MacDonald, and his return to Parliament as member for Cromarty in 1826 was the occasion of great celebrations in the countryside. As a politician he was chiefly noted for his opposition to the Reform Bill. An enthusiastic sportsman, he was the reviver of horse racing at the Northern Meeting at Inverness, and he drove the first coach which ran from Perth to Inverness, on the Queen�s birthday in 1841. At his death in 1881 he was succeeded by his eldest son, Duncan, who married Georgina, daughter of John MacKenzie, M.B., of the Gareloch family, and in turn died in 1889. His son, the sixth and present laird, who was born in 1865, married in 1887 Gwendoline, daughter of William Daiziel MacKenzie of Farr and of Fawley Court, Buckinghamshire. He was trained for a commercial career, but after fourteen years in London, his health breaking down, he retired to live at Tulloch. He takes an active part in county business, is a J.P., D.L., and Honorary Sheriff-Substitute, as well as county commissioner for the Boy Scouts and chairman of various county boards. A keen sportsman and horticulturist, he takes a lively interest in farming, gardening, shooting, fishing, and all games, and as a reflection of his tastes the gardens and policies of Tulloch Castle are among the most beautiful in the north. Tulloch is an ancient barony held by rights from the Crown. The first Davidson lairds took much pleasure in filling the castle with valuable portraits and works of art, and it was a cause of much regret when in July, 1845, the castle was burned down and most of its contents destroyed. On 25th March, 1909, with a view to the formation of a Clan Davidson Society, the Laird of Tulloch called a meeting of holders of the name at the Hotel Metropole in London. Some sixty members of the clan were present, when it was proposed, seconded, and carried that Davidson of Tulloch be recognised and acknowledged as chief of the clan. The act was questioned in a letter to the Northern Chronicle, in which the writer pointed out that, while for a long period of years writers on Highland history had all pointed to Tulloch as the chief, this must be taken as an error seeing that The Mackintosh was the only chief of Clan Chattan. In proof of this statement it was pointed out that in 1703 twenty persons named Dean alias Davidson had at Inverness signed a band of manrent declaring that they and their ancestors had been followers, dependents, and kinsmen to the lairds of Mackintosh, and were still in duty bound to own and maintain the claim, and to follow, assist, and defend the honourable person of Lachlan Mackintosh of that ilk as their true and lawful chieftain. A long correspondence followed pro and con, but it was pointed out by later writers that the acknowledgment of Mackintosh by twenty Davidsons as supreme head of the Clan Chattan confederacy did not prevent the Davidson sept from possessing and following a chief of their own. As a matter of fact, history shows them to have had a chief at the battle of Invernahavon, and by all the laws of Highland genealogy the clansmen were fully entitled to meet and confirm the claim of their present leader and head. Two other landed families of the name in the north are the Davidsons of Cantray and the Davidsons of Inchmarlo. The former are believed to have been settled on the lands of Cantray, an ancient property of the Dallases, for at least two hundred years. In 1767-8 the lands of Cantray and Croy were purchased by David Davidson, son of William Davidson and Agnes MacKercher, who afterwards added Clava to the estate. This laird married Mary, daughter of George Cuthbert of Castlehill, Sheriff-Substitute of Inverness, and is alluded to in the statistical account of 1842 as "a man of singular sagacity, of most active powers of mind, and practical good sense," and as "a liberal-minded and fatherly landlord." His son, another David, was knighted by King George III., and his grandson, Hugh Grogan, the fifth laird, was convener of the country of Inverness. His son, Hugh, the present laird, as an officer of the Seaforth Highlanders, served through the Afghan War of 1880, for which he holds a medal. Inchmarlo, again, was purchased in 1838 by Duncan (Davidson, son of John Davidson of Tilliechetly and Desswood on Deeside. The present laird of Inchmarlo is his grandson, Duncan, while his youngest son�s son is Francis Duncan Davidson, late captain in the Cameron Highlanders and now owner of Desswood. It should be added that Davidson of Tulloch is hereditary keeper of the royal castle of Dingwall. Among notable holders of the name of Davidson mention must be made of the redoubtable provost of Aberdeen, Sir Robert Davidson, who led the burghers of the city at the battle of Harlaw in 1411, and gallantly fell at their head. It is said to be his armour which is still treasured in the vestibule of the City Chambers at Aberdeen, and when the great old church of St. Nicholas in that city was being repaired a generation ago his skeleton was recognised by a red cloth cap with which he had been buried. Another notable clansman was John Davidson, Regent of St. Leonard�s College at St Andrews in the days of Queen Mary, and afterwards the minister of Liberton near Edinburgh, who quarrelled with the Regent Morton, opposed the desire of James VI. to restore prelacy, excommunicated Montgomerie, Bishop of Glasgow, at the desire of the General Assembly in 1582, and was author of Memorials of His Time. 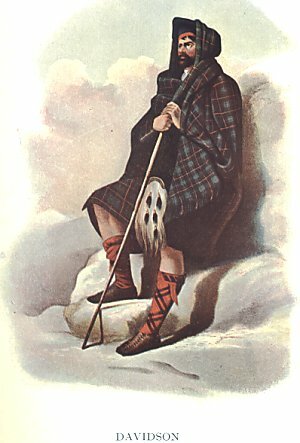 All of the name of Davidson are not necessarily members of the clan, but those of Highland descent are still numerous enough to afford a handsome following for their chief at the present hour. Septs of Clan Davidson: Davie, Davis, Dawson, Dow, Kay, Macdade, Macdaid, MacDavid. Clan Davidson is one of the major Scottish Clans with an identifiable history going back to at least the 11th century. Davidsons have associations with virtually all parts of Scotland, particularly the central Highlands and the Borders. Clan Davidson fought at Culloden, and has played a significant part in Scottish history. The great spread of Scots to Ulster, Canada, the United States, Australia, New Zealand, and many other parts of the globe contained its fair share of Davidsons � underlined by the fact that the Chiefship of the Clan is now held by a New Zealander. The Clan Davidson Chief is a direct descendant of the Tulloch Chiefs of Clan Davidson. The Davidsons of Tulloch claimed descent from the Chief of Clan Davidson/MacDhai of Invernahaven in Badenoch. Tulloch Castle, in Dingwall, Ross-shire, was the residence of Clan Davidson Chiefs from 1762 until the death of Duncan VI of Tulloch in 1917. Duncan VI had no children, and named no heir to the Chiefship. The castle passed into other hands, and the Chiefship lay dormant for nearly eighty years. Duncan VI�s grandfather was Duncan IV of Tulloch. Duncan IV had five wives and eighteen children, and it is from Duncan IV that the current Chief is descended. Duncan IV and his fourth wife had a son, Hector Francis Davidson, who immigrated to New Zealand, where he married and had three sons. The family in New Zealand had always been aware of their position as the last direct descending line. Descent is only through the male line, and it was believed that lines of descent from the first three wives had died out. In the late 1950�s, Hector�s son Eoin sought audience with the Lord Lyon, and for 10 years he attempted to substantiate his claim to be Chief. Eoin was hampered by two things. The first was a counter claim from an earlier Tulloch line, descendants of John Ewen Davidson, the Australian sugar pioneer. Secondly, and of much greater difficulty, there was the tangled genealogical web involving the issue of Duncan IV of Tulloch, who had five wives and 18 legitimate children, not all of whom could be accounted for. After Eoin�s death, his son Duncan took up the challenge, visiting Scotland in 1969. However, he still struggled to find proof of his lineage until the newly formed Clan Davidson Societies in the UK and Australia threw their collective expertise into the effort. Hectors� grandson, Duncan Davidson, was finally recognised by the Lord Lyon King of Arms as Chief in January 1997, eighty years after the last chief had died. Sadly, Duncan was to be Chief for only one year, being succeeded in 1998 by his cousin Alister Guthrie Davidson (Jock), our present chief. Jock�s full title is Alister Guthrie Davidson of Davidston, Chief of the Name and Arms of Davidson and Chief of Clan Davidson. Jock was born in 1924 in Dargaville, north west of Waipu, where his father had a sheep and cattle property. He was educated at Pukehuia Primary School and later at Whangarei Boys High School. On completing his schooling he enlisted at the age of 18 in the Royal New Zealand Air Force where he trained as an engine fitter. In September 1943 he was posted to the Pacific War zone. He served in the Pacific until demobilized in 1946. A career with an engineering supply firm followed, and he eventually became Divisional Manager and finally Consultant before his retirement. Jock and Mary were married in 1952, and raised their three children in Auckland�s Takapuna. Jock has been a keen sportsman all his life. At 75 he still plays golf on a regular basis. He and Mary are enthusiastic gardeners. Since succeeding to the Chiefship, Jock has actively promoted his clan in New Zealand. He is an acknowledged promoter of Scottish tradition and Celtic heritage. The Celtic Council of Australia, which awarded him one of its highest honours, Cyfaill y Celtaid, recently recognized this. Clan Davidson has a new Chief.� Alister �Jock� Davidson passed away in Auckland NZ on 26 December 2015. His eldest son, Grant Guthrie Davidson, 3rd of Davidston, is now the current chief. He lives in Auckland, New Zealand. 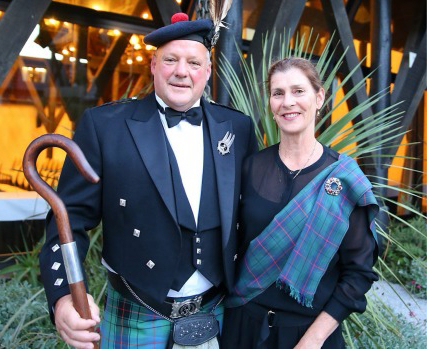 Chief of the Clan Davidson, Grant Guthrie Davidson, pictured with wife Brenda, was announced as chief in a ceremony in Christchurch at the Chateau on the Park. There are active Clan Davidson Societies in the United Kingdom, United States, Canada, Australia and New Zealand. To apply for membership of the Clan Davidson Society in New Zealand contact the Secretary, Mrs Maureen MacDonald, 10 Kingston Street, Lower Hutt, phone (04) 577 2225 or email maureenmac@xtra.co.nz .